On February 14, 2017, I came into an attention that put me in disarray on a new movement emmeregnce under a slogan “One Nation”. Though I didn’t feel curious on what he wanted me to be curious about, I rather was curious to know why a new movement under a new slogan is popping up? And the person I know is the same person that I know by his close association and involvement in the EYSC affairs and an urdent promoter of “Eritrea for Eritreans” that has been used as their driving motto. Well, what I learned from this statement is that a new movement is born. Another addition in the over-saturated political landscape of opposition camp. keeping aside on the newly popped-up movement, the picture they put(see above) is familiar to me since my childhood: A photo that is highly utilized by PFDJ junta – 9 ethic groups classification system. Of course, Eritrea is for Eritreans – no matter to which social group we belong or from we come, who ever claims to be an Eritrean is an Eritrean. Believing to be an Eritrean is not a priviledge but a right. With this in mind, origin or ethnic classification is the least criteria I prefer to put as a symbol of unity. I went further into their page if they have a clear objective, mission and vision. What I found is a “Five Point List” that show their detailed mission or beliefs(see in the figure below). Here the flaw is: the movement neither specified the difference that exists nor has acknowledged its existence. It is a vague description and misleading that can be interprated in different ways for a different purpose. If One Nation Movement believes that there is a real and existing problems, it should clearly address or indicate against what it stands for. By calling simply “Irrespective” is creating a crowd of forces that have no common unitary agenda. If, according to their belief, the existing repressive political problems is terminated, the problems will surface as they have embraced all forces, irrespective of their differences. From this what can be exploded is another turmoil of political struggle and chaos during the transition period of full and accountable governance. In respective, what this newly emerging One Nation Movement has ignored during the conception phase is to learn from 30 years Eritrean struggle under the same theme that they look to have mbraced right now. During our 30 years struggle, the then newly born EPLF(after 1970) called all Eritrean people to unite and struggle under a banner of “irrespective of our differences”. Of course the people responded positively. Once they joined in, it became a closed chamber that made a taboo to breath on their existing grievances. Since the bigger enemy was not removed, the people supressed its feelings thinking that there will be room for political evolution. Once independence was achieved, people’s grievances started to surface as an agenda to discuss about demanding extensive dialoge for political freedom. The then victorious force, EPLF instead hijacked all the dreams and aspirations the people had and changed itself into a totalitarian junta under the newly established front called PFDJ. And the result is where we are now. It is therefore a flaw of political fortune to start with the same mistake. If One Nation movement is for one and united nation, it should clearly outline the difference that exists and stand against those that damage the notion of “One Nation”. This statement has totally ignored the reality of the oppressive regime. I won’t be surprised if they claim so, but what they should seriously analyse is the objective realistic challenge of creating a force that can challenge the oppressive regime to topple PFDJ regime. It is almost impossible to emmerge a united force within Eritrea unless there is a strong force that works outside. What makes this statement a flaw is that the movement considers itself as a supplementary, not a direct shareholder in the struggle. The term ‘supplement’ is defined as ” something that completes or makes an addition”. It shows, the movement is not the main ingredient. And this shows an escape from direct responsibility. In addition, it is trying to show that there is an on- going movement inside Eritrea that does not exist on relaity – a kind of empty propaganda in use by MEDREK. If One Nation Movement is really a genuine movement, it should have considered itself as part of the main ingredient for change, not a supplementary. More than that, it has ignored all the other existing political forces that are working outside Eritrea. This is an isult to forces that are working relentlessely to end the oppressive regime by being outside Eritrea. I found this discriminatory and anti-unity. It is an absolute ignorance of the existing grievances of our people across different sectors. For example, there are Eritreans who were denied their rights to live in Eritrea under the same accusation. for example: the Jehovah Witness. These people are denied their basic human rights to live in the land they believe they belong by birth. As part of their belief, they value heavenly kingdom not earthly kingdom. just for this, they are discriminated, forced to be converted, tortured and many forced to flee from the country that they only were supposed to live peaefully. And with a political trauma caused under PFDJ, there are extremists who reject the notion of one nation and wanted to use their democratic rights to advocate for a greater unity or wanting to unite with Ethiopia. But first and foremost they want to end the oppressive regime in Eritrea so that they can use their political rights to advance their views. Not only this, there are forces that want to have their own state, or at least an autonomous state, and others wanted an ethnic based administrative system. And very recently, there is a movement to create a new state out of the the existing Eritrean state and call it “Agazian Nation”. These forces will feel excluded and might work against the objectives of One Nation Movement. This will lead into another enemy. Hence, this objective contradicts with the notion of “Irrespective of their ethnic, regional or religious differences”. Once you read N°. 3 of What We Believe, this statement does not make sense. My argument is: “How come a victory of a movement that becomes victorious by excluding those who does not believe on its movement mission be a victory of all Eritreans”? 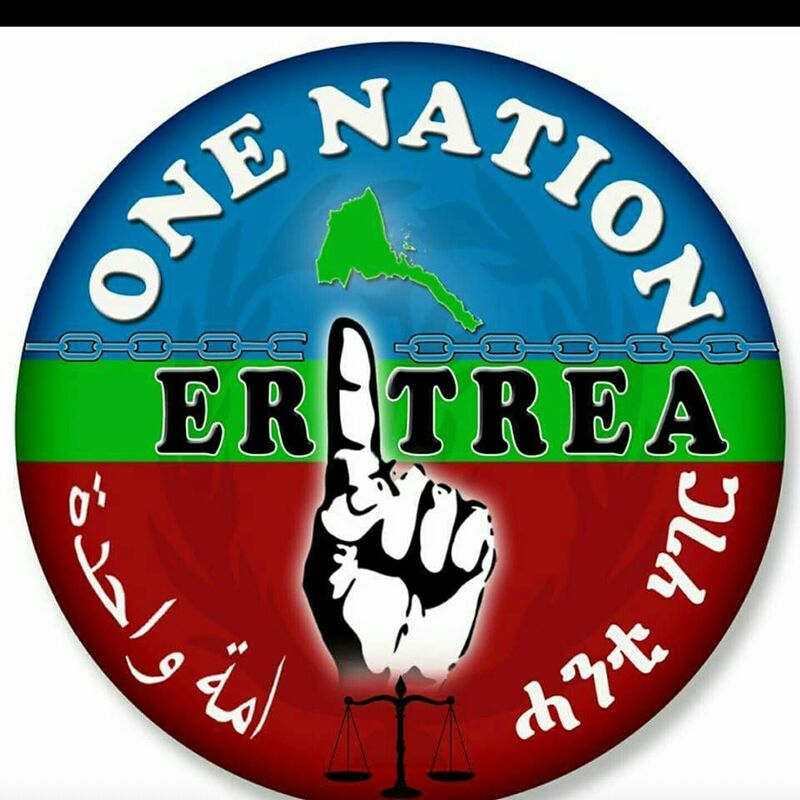 In fact, One Nation Movement does not include all Eritreans as its N°. 3 theme reveals. This outlook has stayed in the Eritrean landscape since the 1940s and in modern politics with the rise of EYSC. EYSC had, now I am not sure their status, a guiding principle of “Eritrea for Eritreans”. This principle has put EYSC at odds with Simret, now ESMNS(Eritrean Solidarity Movement for National Salvation)and many other forces that are based in Ethiopia. Notable EYSC figures worked hard to explain the notion of “Eritrea for Eritreans”. At its core value, it is all about rejecting any interference by outsiders in the political affairs of Eritrea. These days, there are opposition groups stationed in Ethiopia and get logistical help from the Ethiopian government. It is not therefore difficult to imagine this belief of One Nation will continue to be the main leverage for disagreements that will occur between these forces. To expand further the flaw of “One Nation Movement” is seems to be founded on ethnic based social category zs given in the first photo. This is a total ignorance of existing public grievances. The current social classification system is based on Socialism ideology. According to socialism, societies are forced to cluster themselves as minimum as possible so that controlling and recognistion can very simpler. In fact, the way ethnicity is recognized is by merging different cultures into a common trend so that a new social culture can emerge in accordance to social evolutions. if people are left as they are, socialists beleive that it is difficult to control and build a progressive society. This was introduced to Eritreans during the armed struggle and is further inforced after independence. The irony is: there are certain ethnic group names that insults social values. for example, the word Tigre signifies a “slave”. Though there is a spoken language commonly used by different sociaties called “Tigrait”, there is no common cultural connection that catagorize or put them as such.These people therefore strongly reject the use of Tigre Ethnic group and they prefer to call themselves according to who they really are. Very recently, there is also another movement that is emerging from the Tigrigna speaking society. They are starting to identify themselves as “Agazians” they reject the notion of Tigrigna as a name of their social groups though they call themselves “Tigrigna speakers”. Another challenge for this movement is that there people who want to be identified in the way they are and that reflects their common values. For example, “The Jeberti Ethnic Group”. The Jeberti people grievances is so deep that they even established a political party called, Al-Nahda Party, that fights for their rights of recognition as a separate Ethnic group and with a national political programs.For more, they can be reached at Jeberti People. Although the party that fights for Jeberti Etnic recognition might not a political solution, it is an indication of how deeply they are affected by their call for their rights. Not only this, there are ignored people inside Eritrea who didn’t get any opportunity to say about themselves. These include: Hausa, commonly called, Tokhirir, The Hausa and Bargo Nigerian-Eritreans, who are collectively called the Tokharir, migrated to Eritrea almost a century ago that live along Gash-river banks andDahlaki people, who native settlers of Dahlak island which have their own spoken language. It is not a surprising if one can relate One Nation and Hade Libi slogans as the same. Both recognize Eritrea as home of only nine ethnic groups, puts unity as a must irrespective of ethnic, regional or religious differences, excludes anyone who is not abided by nationalism principles defined during the 30 years struggle. Another similarity they have is they are both a means of rebuff for anti-national rherotics that they both consider as anti Eritrean sovereignity and statehood. The biggest similarity they have is, they put nation first before anything. Like the PFDJ mantra, One Nation is emerging with a saga of, “First Nation”. This is what is driving all youth to flee and the country to suffer under the totalitarian regime. What is really missing from the ‘One Nation belief? In the five point list, I didn’t read anything related to Constitution, rule of law, democracy, justice or human rights ideals. Even not a single mention of these words exists between the lines. Not a single word! Anyone who is interested on human values and justice, the five point belief is a clear sign of these nationalist, or far right political movement. In fact, every line put indicates their nationalistic point of view, patriotic agenda and discriminatory beliefs. Now that Eritreans are thirsty of basic human rights and justice in their home country, it is a big mistake to see another movement with an objective of enforcing “Nation First ideology”. Eritreans are not deprived of nationalistic views or ignore on the notion of One nation, what they are looking thirstly are for justice and rights to live a simple life in their home country. Be it from outside or inside, any force or both, any force that removes the brutal regime of PFDJ is welcome. If One Nation Movement has any belief on its people, first and foremost they should also know that it is the belief of any Eritrean to invite anyone who can help them to remove PFDJ from power albeit it will happen sooner. In the home page of their website, one can see a slide of photos that reflects their beliefs. In one slide, there is a photo that shows a flag that is imposed to the Eritrean people by EPLF without people’s consensus. Many reject this symbol, including me, as it is a sign of oppression and injustice. Putting such flag in the background shows how much the movment is ignoring public grievances. Rather, One Nation Movement looks to endorse current impossion put by EPLF and now PFDJ as their symbol. Those who fought under the blue olive flag, and forced for exile never let down their sysmbol to fall. Rather, since 1961, the blue flag became a symbol of Eritrean people. And now, it is a symbol of justice and anti-oppression. By ignoring this flag and putting the oppressor’s flad as a background is a complete suppression of justice and historic grievances. If you really care on restoring Eritrean dignity, fight for Eritreans to have their rights as people to live, a constitution to be guided with, a rule of law to be respected, a justice to govern and all dimensioned developments for their prosperity. No justice seeking Eritrean now will stand in the notion of nationalism under the banner of nation first – or one nation as you are standing for. This is what is going on for the last 60 years and still putting Eritreans in slavery. Justice – for the daily life. If all these are restored, it is a big endevour to witness love of the country to be a daily reflection of each individual. If not, as we can see today, people will continue to suffer and endanger their lives to escape from oppression. Look writter. This movement is calling eritreans who believes the five key points. Those who willing to fight for justice being one nation, rather than dividing in region, ethinic, tribe and religion and come together set and build their guids,laws, objective and their chairman too. This system insures that, a mass of people should set and build the laws and elect their chairman. If a small group come with their core points laws and everything and call to the mass to join them its not democratic . And no longer the group will disperce .this is the situation that all group of movements facing on .